During a panel at the recent Fantasycon 2011, the wonderful and intelligent Juliet McKenna commented that it is a sign of a genre’s maturity when authors increasingly start playing with the recognised rules and mash conventions up in interesting ways. Enter Blake Charlton, who has certainly taken the word spell far more literally than most Fantasy writers – but then he suffers from dyslexia. Nicodemus Weal has trained at the stronghold of Starhaven since he was a boy. His mentor, the famous wizard Magister Shannon, taught him how to cast spells made from luminescent magical runes, how to peel written words off a page and make them physically real. Initially, Nicodemus showed great promise. Able to forge runes with great speed, he was once thought to be the Halcyon – a powerful spellwright prophesied to prevent the apocalypse known as the Disjunction. There was only one problem. Nicodemus couldn’t spell. Every time he touched a magical text, he unintentionally corrupted it, creating a dangerous, potentially deadly misspell. Now aged twenty-five, while his peers advance as wizards, he is still an apprentice, dealing with the devastating knowledge that he has failed to live up to the expectations of his teachers and classmates. But not everyone interprets prophecy in the same way. There are factions who believe someone like Nicodemus could hold great power – power than might be used as easily for evil as for good. Despite the cool cover and intriguing blurb, this isn’t a book that will necessarily grab you by the throat and whisk you along from page one. Charlton silts up the initial action with a lot of exposition and scene setting – and while I’ll concede that the world and concept is a complex, multi-layered one, I do feel he slightly overdoes it. However, my advice is to stick with it. This is a book that goes on delivering, steadily gaining pace and readability throughout until at the end, I wondered why I ever considered giving up halfway through the second chapter. Nicodemus is a well written, enjoyable character – it makes a refreshing change to meet a protagonist who has miserably failed to fulfil his golden destiny. I enjoyed his chippy, suspicious view of the world. His ability to whip out a spell in no time flat worked well with his inability to necessarily see things that were plainly under his nose – having worked with dyslexic students for a chunk of my teaching career, this unevenness in ability and talent seemed entirely convincing. All the main characters are reasonably complex, although Shannon is outstanding, with hidden depths and a very interesting history that isn’t revealed till far later into the book when we really care about him. 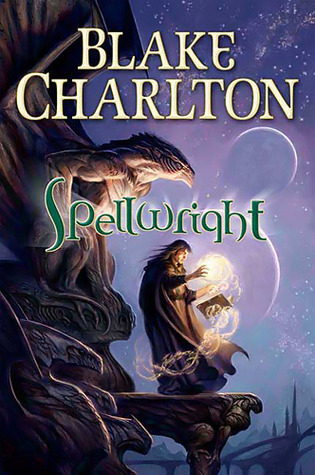 While the initial idea of spelling spells is a cool one, Charlston doesn’t lean too heavily on it throughout the book. His eerie stone stronghold built by a lost race high in the mountains makes a compelling backdrop to the action and as the book builds to the climactic ending, I was thoroughly engrossed and wanting to read the next instalment in this intriguing Fantasy debut.